In my heart I knew it was probably foolish to venture forth on Wednesday. In my defence the weather looked a little better than it would do Thursday, and I was getting itchy feet and trigger-happy. I’ve been for a walk along Latchmore Brook in precisely the same conditions before; slightly wetter if I remember. Not that it was raining; more an ultra-fine drizzle to dampen spirits and keep all Odos hidden. Not one did I see. 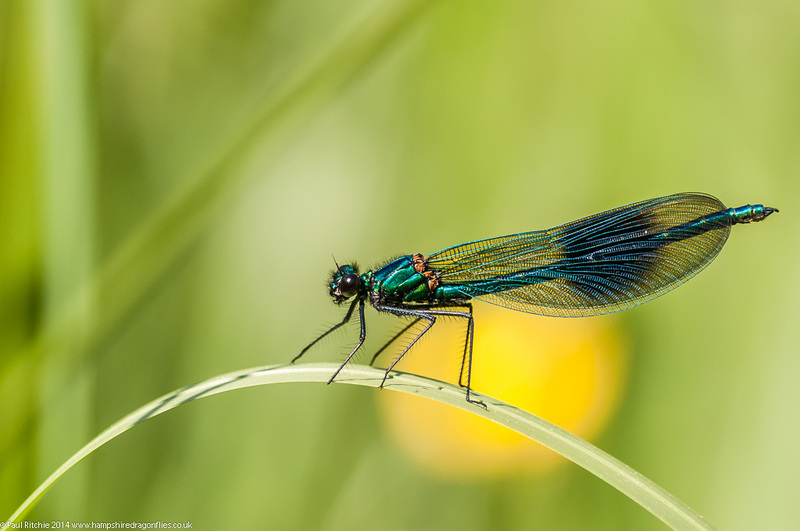 Not even a Beautiful Demoiselle, and that’s going some! Still, I’m out now and may as well enjoy myself, so I went for a bathe at Troublefield. I only have myself to blame really; I did say I’d like the rain to continue on a regular basis to keep the cattle at bay a little longer. Now you really have to be committed (perhaps I should be?) to enter three-foot-high and rising soaking wet vegetation with at least six inches of standing water, but I was game if the dragonflies were. Tightening the straps on my wellies to hopefully form a seal didn’t really help as the water headed from my thighs to my socks through capillary action, but once your wet, you’re wet. 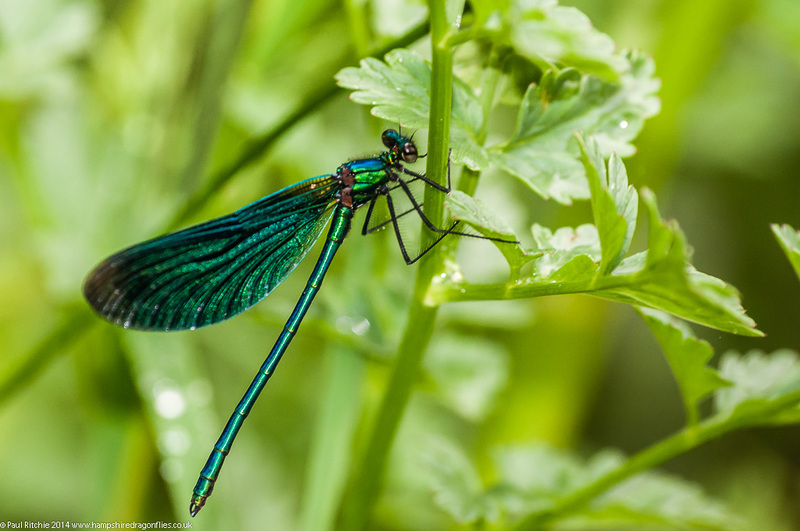 I didn’t expect to see anything larger than Demoiselles and I didn’t, so I occupied myself with the few brave Banded and Beautiful who chose to join me. 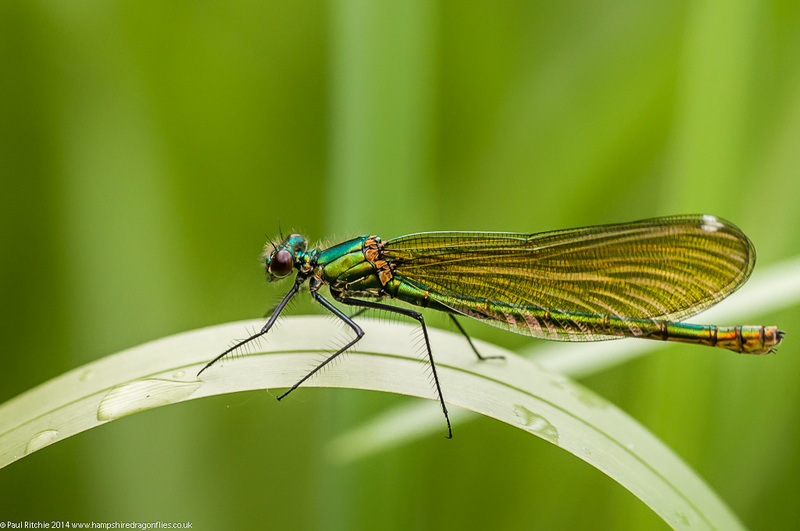 When both Demoiselles occur in the same habitat it can be difficult to the untrained eye to distinguish between the females. A basic rule of thumb is wing colour – Beautiful = brown and Banded = green, but this can be unreliable in certain lighting conditions. 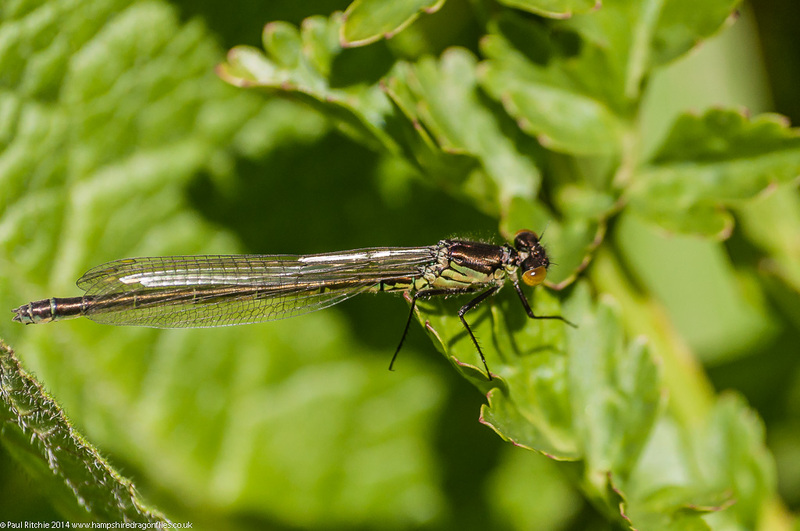 A more reliable method is to observe the position of the pterostigma (wing spot) – closer to the rear edge in the Banded. Another feature is the venation of the wings. In the Beautiful these are more densely-packed, allowing less light through, as you should be able to see from the above images. A few more rainy days will give me time to dig in and learn a little more about those other fascinating creatures I come across, and will stand as a go-to reference in the future. Naturally it includes a dedicated section on dragonflies, and if you look closely you might find a few photos from yours truly. 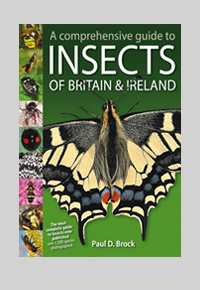 At first glance it’s a very worthy tome, and deserves a place on everyone’s bookshelf for being ‘The most complete guide to Insects ever published’. Click on the above image for further details. 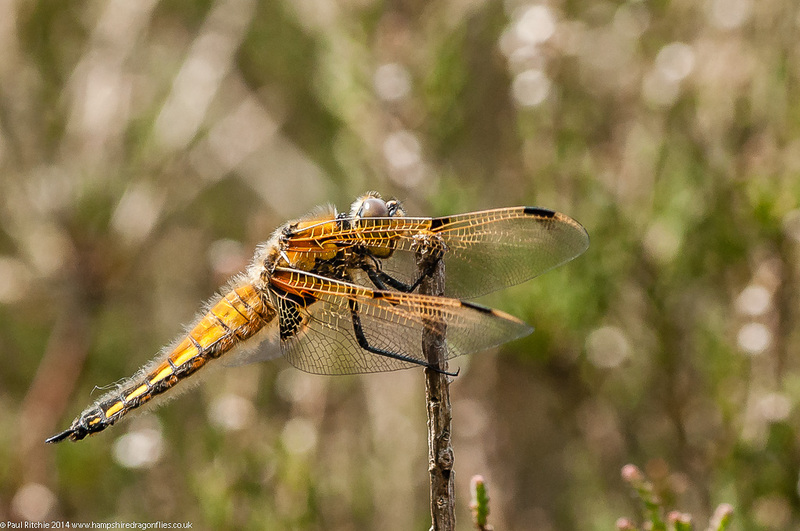 Any Bank Holiday Weekend for me means head anywhere but west and if possible avoid the New Forest, so in a peak of anticipation we headed to Thursley Common for the first time this season. 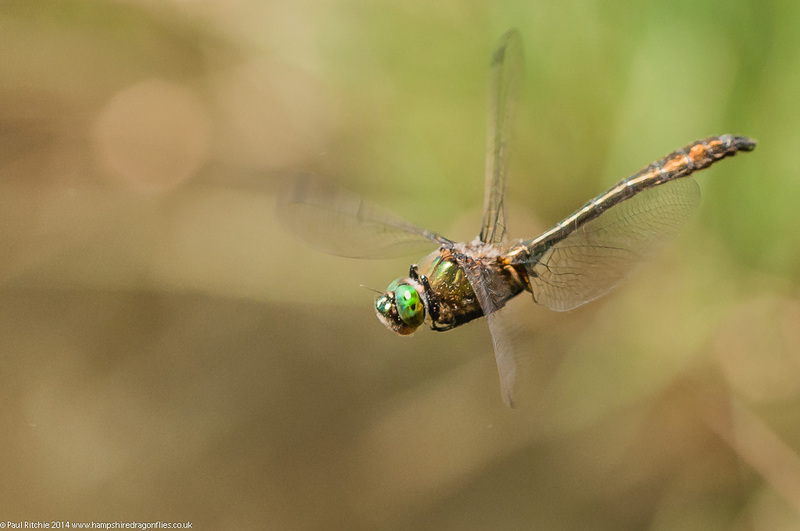 Arriving bang on midday Doug and I busied ourselves around the marshy section of the Moat pond where a few Four-spotted Chasers were patrolling along with a couple of Downy Emerald. We were facing the sun and so were our subjects, which meant rear end shot or nothing. 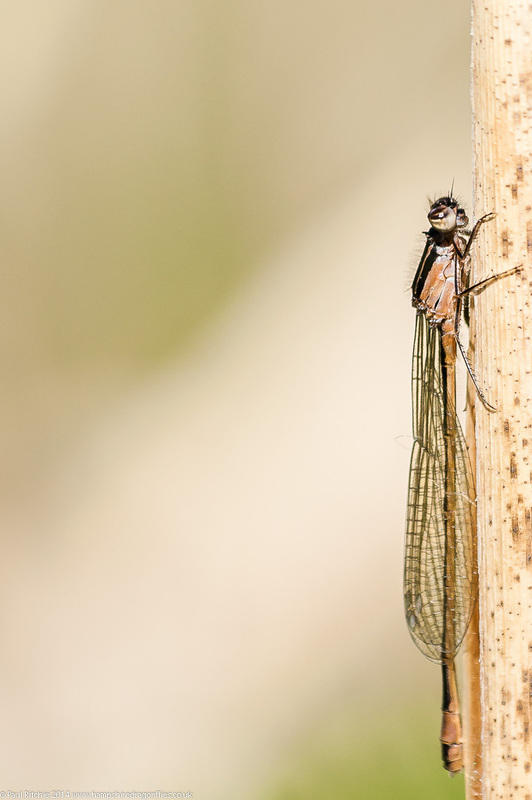 I opted for nothing and searched the reeds for damsels and along the back track for any sheltering Odos. 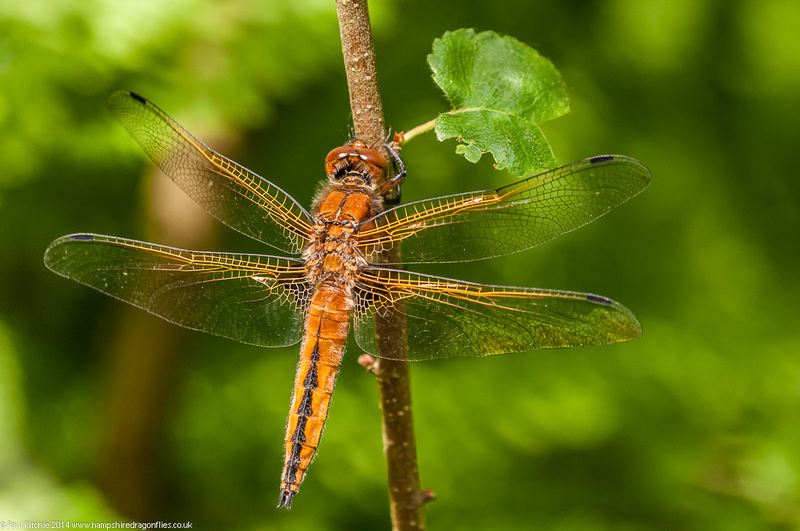 I found a couple of fresh Keeled Skimmers and perched a Four-spotted Chaser to start the day. We decided to do a circuit, heading first towards the stream and checking the heather on route. A few more Four-spots and Keeled hunkered down out of this incessant wind. The smaller pools were mostly devoid of any action, as was the stream, and the board walks were very disappointing. At this time of year you should be tripping over FSC’s, watching anything up to a dozen Hobby take their fill while carefully trying to avoid the Common Lizards under your feet, but even these had chosen shelter. Returning to the Moat Pond we decided to concentrate our attention on the less exposed side where there were a couple of sheltered hollows. Thankfully we had a Downy each to keep us occupied, allowing us to get some in-flight practice in. Every now and again a Mallard with her brood would interfere, fat on handouts, a price you have to pay for a spot popular with picnickers and dog walkers. Earlier I spotted one of these ducklings picking tasty morsels from the base of some reeds, maybe some unfortunate emergents. The boldest of these even had the cheek to wait with me for my quarry and even strike out as he briefly hovered. If you sit and wait there’s no telling what might appear next. 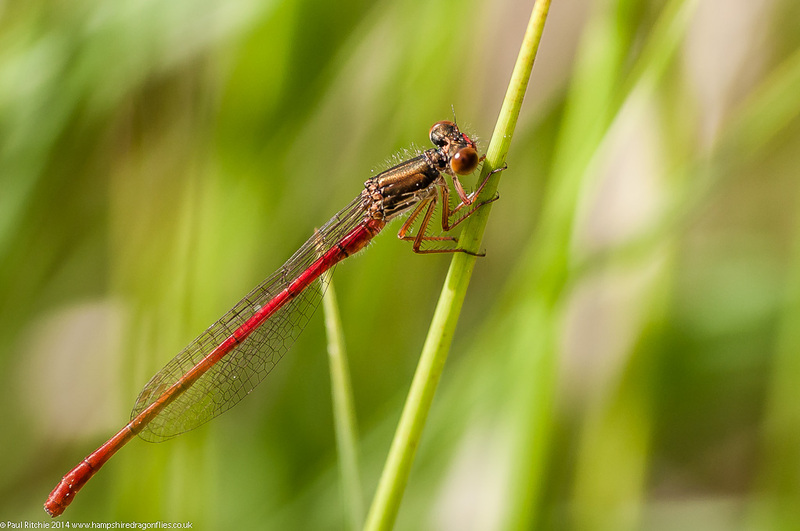 Doug had to leave at 3.30pm so I busied myself in the reeds looking for damsels and found a couple of Small Red, my first of the season. We took another (shorter) walk to check hawker alley and the pond with the pontoon, but at the risk of repeating myself we called it a day at 5.00pm satisfied we weren’t going home empty handed. 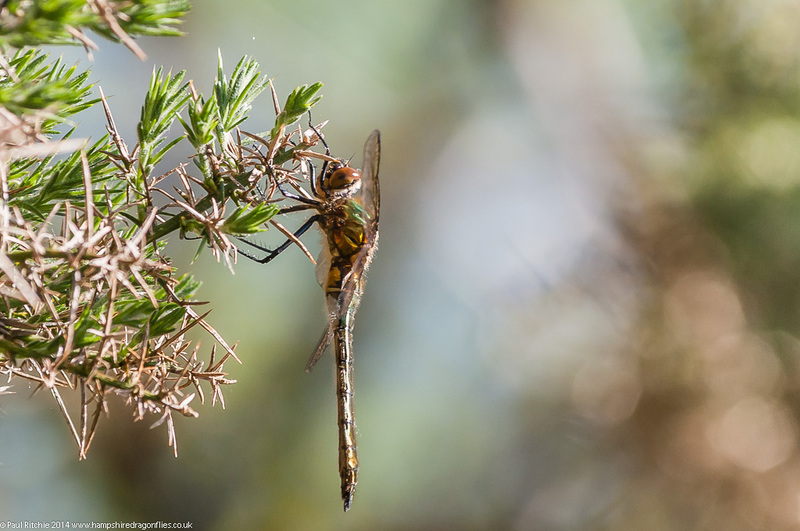 Thursley quite-rightly has a reputation of being a hot-spot for dragonflies with most of the New Forest species present and the hope of a Brilliant Emerald if you’re lucky, but maybe today was a little too early in the season. Hopefully in a couple of weeks a return visit should see at least one patrolling the Moat. Just remember to choose a day with little or no wind! 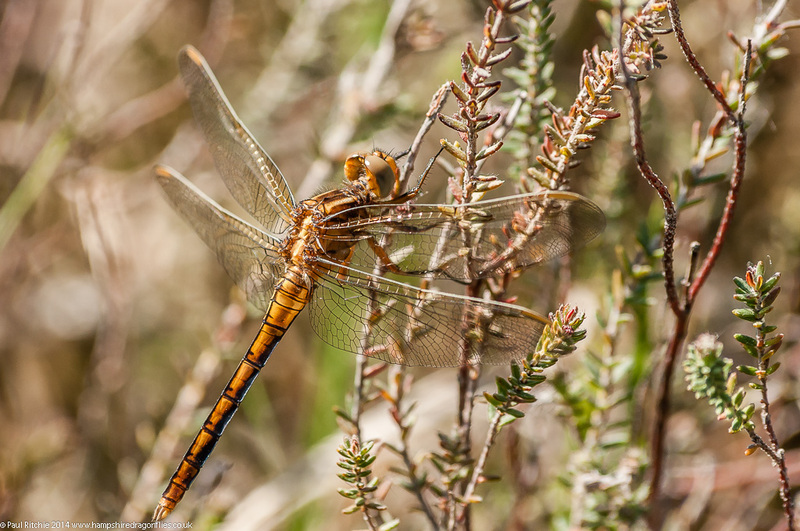 There are a few wondrous spectacles which every dragonfly enthusiast needs to witness. 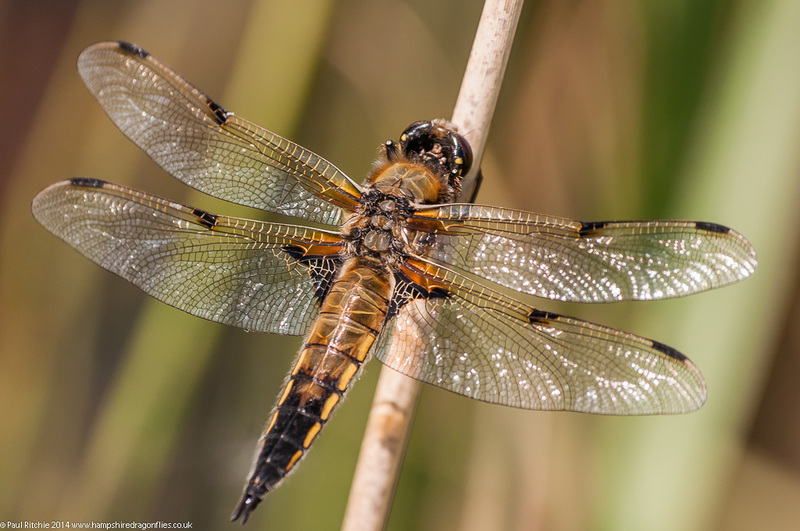 The annual rise of the Keeled Skimmers on Ober Water, the hoards of Common Darters in woodlands late summer, my personal favourite, Ober Water during June, and the cascading Banded Demoiselles along the River Stour. I missed this event at Canford Magna last season as they were repairing the footbridge. 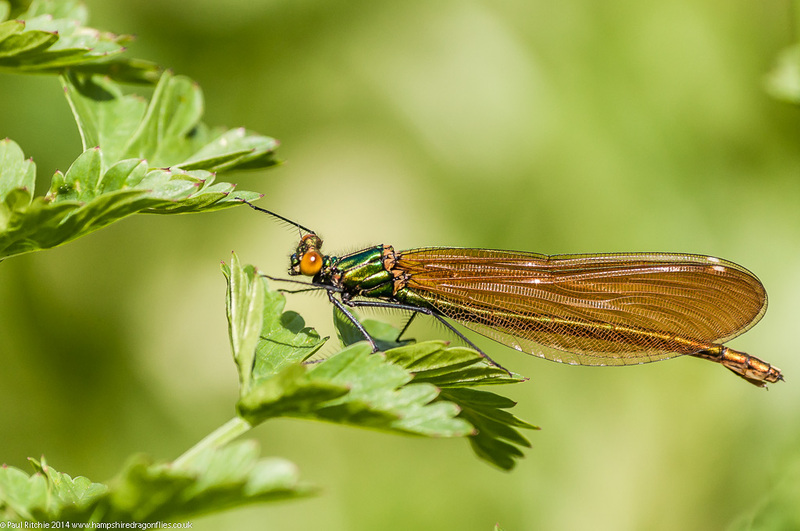 The Demoiselle display alone is worth the visit, but the chance of some White-legged gave me extra reason to venture out on a sunny Wednesday morning. I did find a few tenerals, but they involved some hard work and tenacity. Although sightings have been reported elsewhere in the country, it is still early and it wouldn’t surprise me if the ones I found were morning fresh or a day old at most. I took the opportunity to scour the far margins of the meadow, following the tree-line back to shore, and the morning still very much belonged to the Banded. I did have one brief spotting of a Scarce Chaser, but there was no way I was running the distance across open ground knowing full well if I did spot it again it would be up and across the river. A few years back I would rank the Banded as one of the trickiest species to photograph, regardless of numbers. They will rise before you have a chance to focus, land often, but not always a short distance away, and more times than not offer you a face-on view where they can keep an eye on you. 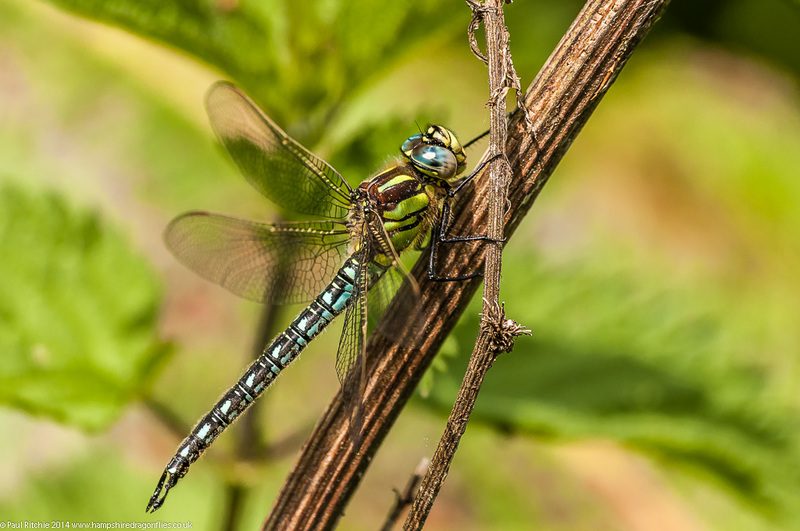 To me the best shots of these spectacular insects are a side-on profile, taken in direct sunlight where you can appreciate fully the reflective qualities of their diaphanous wings. The brief hour and a half spent was certainly worthwhile, but I was pushed for time today and wanted to grab another slice of Troublefield while I could. Barely 10 miles away, the traffic was unbearable and it was a toss up between me or the radiator over-heating. Time wasted in traffic could be time well spent in a little slice of paradise. My little slice didn’t look too promising to begin with, as the sun had all but disappeared. At first sight this enchanted meadow seemed to lose some of it’s charm in dull conditions, and even the Demoiselles were subdued, but I put this down to my still-frazzled emotions from the journey over. 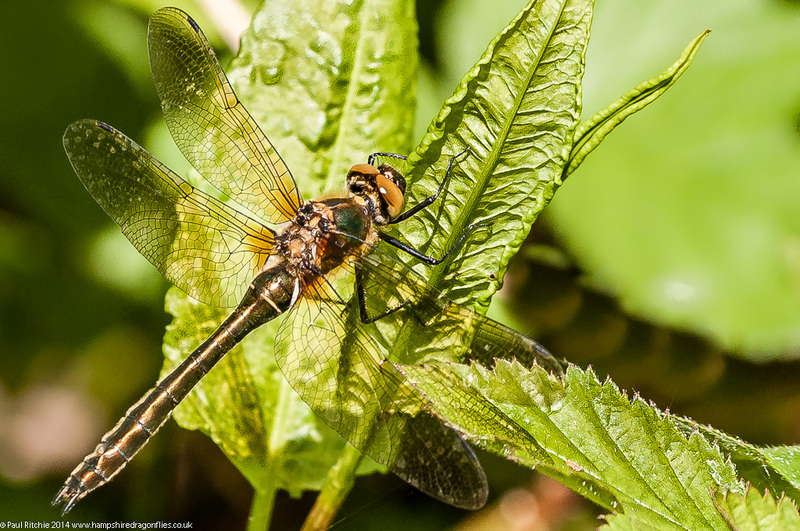 I forced myself to calm down and do a little gentle flushing, and it wasn’t long before I spotted my first Scarce Chaser. I find these a little more challenging than their cousins; definitely more nervous, and they have the annoying ability to disappear completely from sight when gliding across the meadow. Luckily my quarry today didn’t glide too far at each approach, and eventually I managed to pin him down. In some part I blame the bright red t-shirt. Much too easy to see my approach. I should have wore my usual (unintentionally camouflaged) green, but health & safety have probably got a warrant out on some of my recent attire. Still, rain forecast tomorrow so time for a bit of laundry. 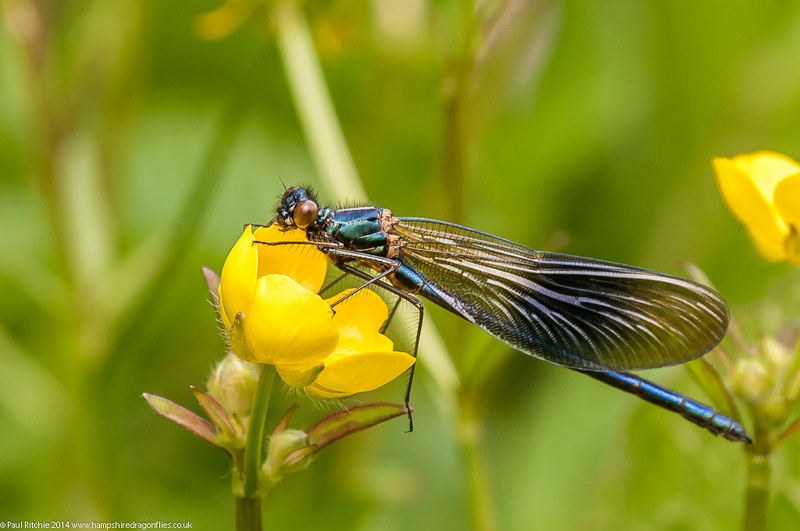 Another one of those fabulous sights in Spring are the brilliant satin-blue of fresh male Demoiselles. 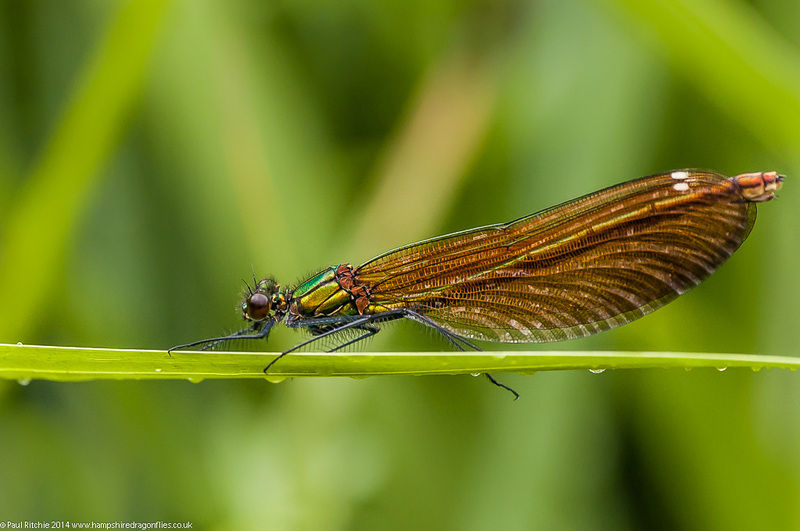 I remember falling completely in love with a fresh male Beautiful Demoiselle at Ober Water last season, in some ways even more attractive than the mature metallic brilliance. Following this particular teneral to a convenient perch I came across a perched male Hairy mere inches behind my quarry’s perch. He allowed me a couple of repositions before revving up his wings and gliding off along the river. Those Scarce Chasers were positively dawdlers by comparison. At first I thought this might be the same individual from Monday, but after checking side-by-side photographs when I got home I realised this was another male. Even disregarding the obvious damage to this one’s right eye (which you can;t see in this photograph, and no – I hadn’t punched it!) there were distinctive and subtly variables in the thorax and abdomen patterning. My phone rang reminding me it was time to wrap up for the day, just as things appeared to be improving. Certainly by 1.30pm there was far more action, and on the way out in the meadow containing the gate I spotted half-a-dozen more Scarce Chasers. They certainly weren’t (visibly) there when I arrived and they certainly gave me a most welcome farewell salute. In most people’s ideal world it would rain at night, leaving us free to enjoy our life-giving sun throughout our waking hours. In this ideal world we could pick and choose which days to go out and which days to rest; instead of frantically trying to fit it all in in case this is our summer and we should make the most of it before we have to board the ark. For this I have once again been guilty, using each available hour to soak up the sunshine , atmosphere and bounty to the extent that I struggled to get out Friday because I had too much to do and catch up on. No bother – I’ll just choose to go out later. It’s not like Titchfield is about to drift along the Solent. A nice couple of hours rooted to a small catchment area sounded ideal to my tired limbs and chaotic mind. There’ll be hundreds of Odo’s at my feet and I can spend most of my time sat on the bench just watching. Yeah…right! The problem is I rarely sit still; only at Crockford or Ober Water when passing traffic negates a need to wander. As it was I had to play the happy wanderer just to find anything this afternoon. 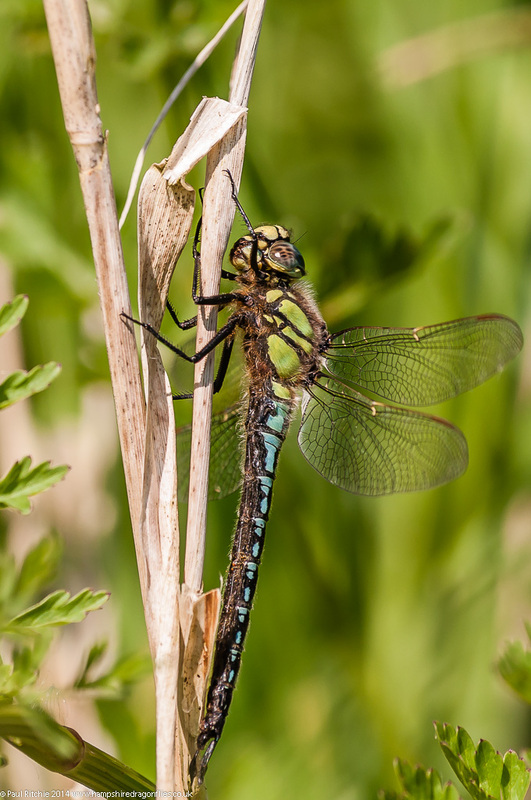 Sure, there were reasonable numbers of Large Red, Azure, and Blue-tailed – maybe even a Common Blue or two – but nowhere near expected. Larger species were also mostly absent. I at least expected to see good numbers of Banded Demoiselle, but didn’t see one. 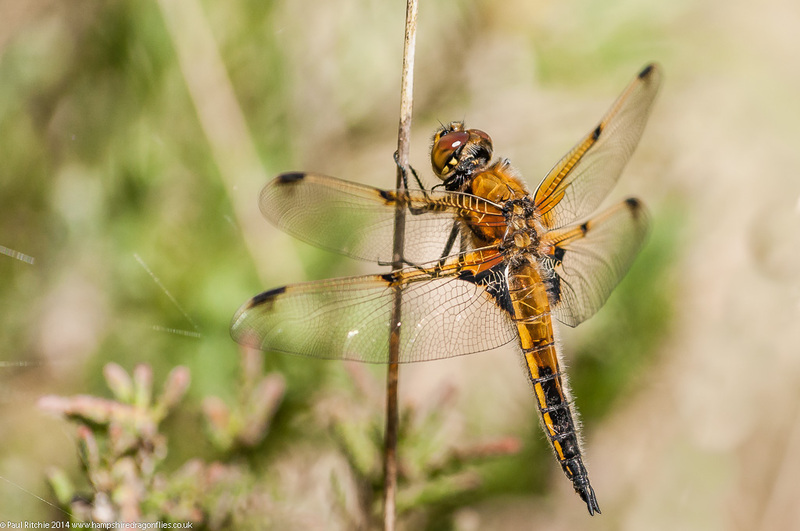 I also expected to see reasonable numbers of Four-spotted Chaser, but the only ones here today were a male disturbed along the track and our companion at the pond. At least there was some subdued action on the pond, with representatives of each flying in tandem or joined in the familiar wheel. Besides our resident Four-spotted was a Hairy or two weaving in and out of the reeds barely clearing the surface, hunting for a female. On one observed occasions he struck lucky and grabbed his female, locking her into the wheel and soared above the pond, circled looking for a place to park before frustratingly choosing the top of a nearby tree. I was still fuming from an earlier pair who Sue found perched perfectly low down, only to rise just before I gained position and moved almost out of reach around the pond. Before I could follow they rose and once again perched perfectly on a reed across the path before changing their mind and choosing to rise above the trees and disappearing out of sight. After another disappointing search I settled on the edge of the pond and watched as the Hairy came in and picked a fight with the Four-spotted, taking him down to the water’s surface in a tussle before realising he’d bitten off more than he could chew and disappearing in defeat. I’ve seen a Hairy take on an Emperor on many occasions and win, but the sheer bulk of the Four-spotted had a different outcome. He came in for another go though, and this time was chased into the air before falling defeated to rest low down, catching his breath and giving me enough time grab second prize. It isn’t all halcyon days filled with one opportunity after another, and despite stepping in something undesirable earlier in the day my luck remained in the tired and slightly irritable part of my brain. Or did it? I’m rather pleased with my Hairy opportunity and shouldn’t be bothered I missed those pairs, as I’ve had successful opportunities before. There’ll always be another one. I had a day of rest on Saturday and left it until Sunday to visit Pennington. Sue and I arrived just after lunch and I must say it was rather disappointing. 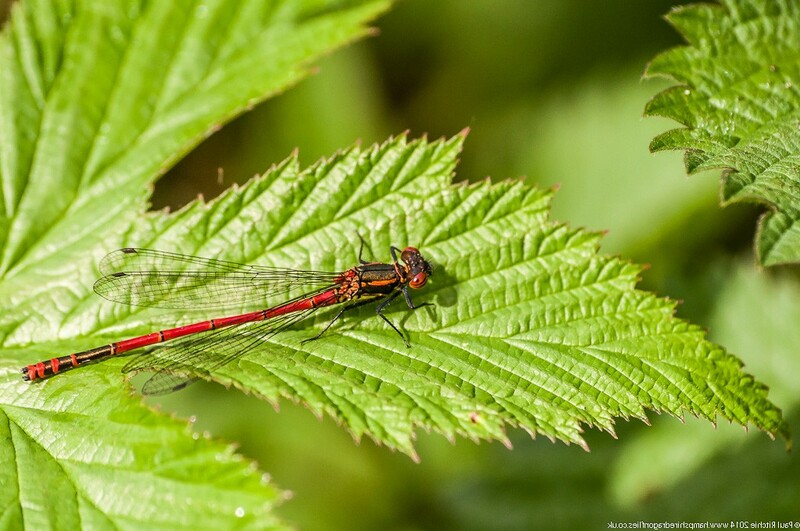 There were a few small, sheltered pockets along the shore where Azure, Blue-tailed, Large Red and Red-eyed were busy over water, but the foliage revealed far less than our visit a fortnight ago. 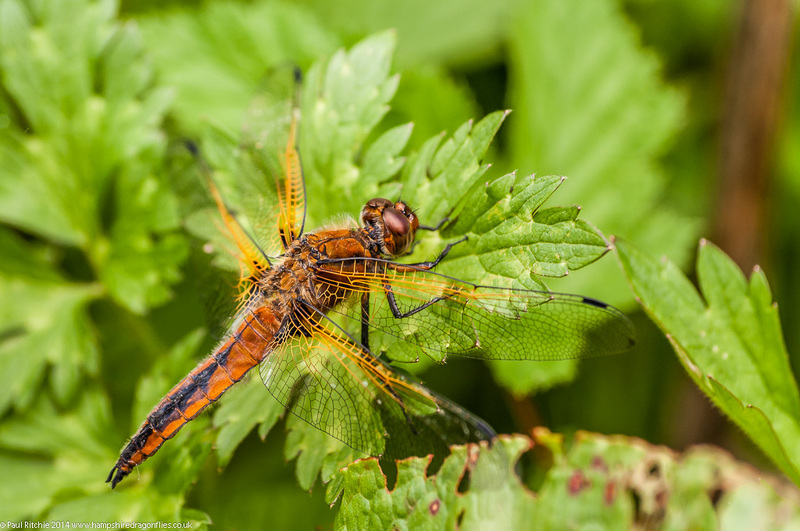 I had expected to at least see a Hairy, but the only sign of anything larger was the fleeting glimpse of a Scarce Chaser which I attempted to follow, but lost it as it disappeared around a thicket. A sighting at least, and another species added to this season’s count. 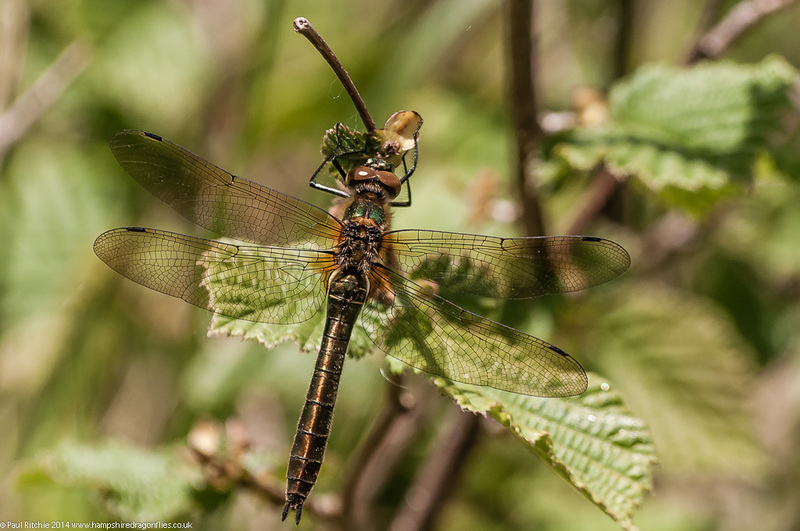 A call into Crockford revealed a few Beautiful Demoiselles, a fair number of Broad-bodied Chasers, a Four-spotted and some Large Red. No sign of any Southern Damselflies though. 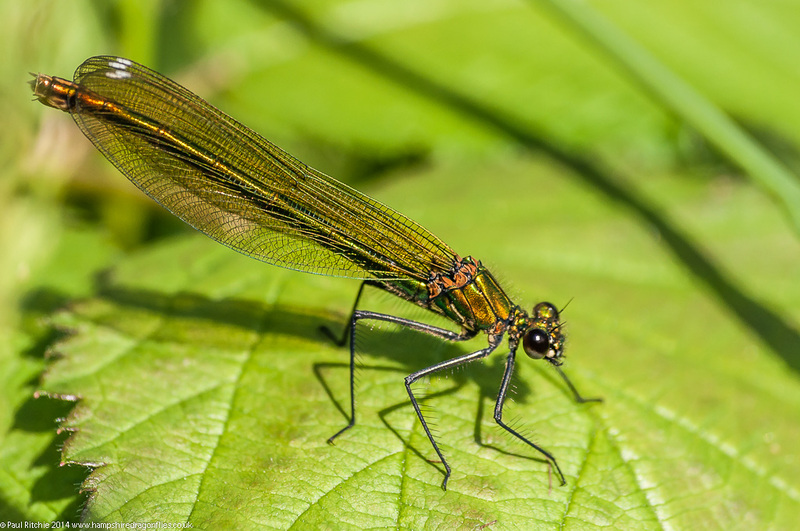 Hatchet small pond provided a patrolling male Downy over the water, some damsel mating action and a couple of sightings of teneral Keeled Skimmers – another new one for me this year. Both eluded me though. 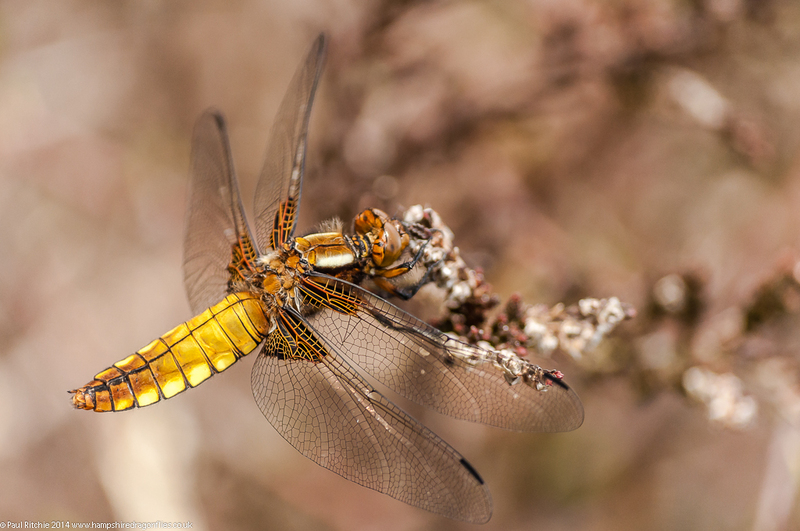 In Hawkhill there was a Broad-bodied Chaser feeding around the scrub. 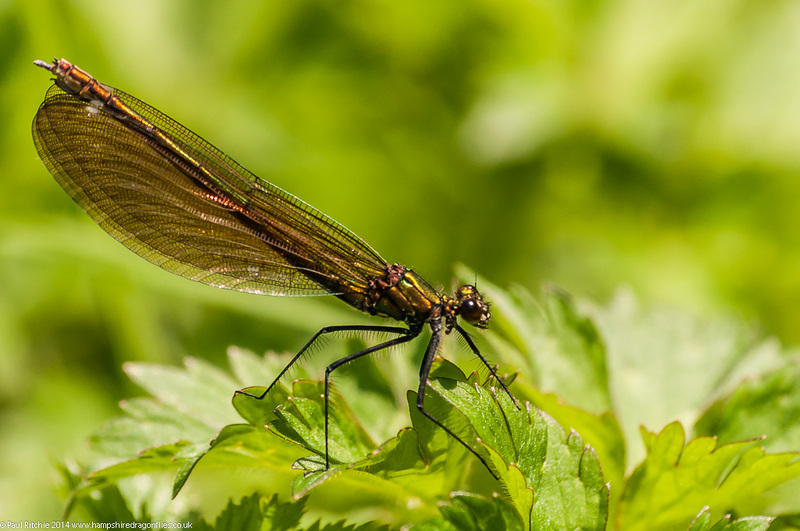 Finally onto Puttles Bridge, where Paul Winters had spotted a few Keeled Skimmers on Friday. I knew we should at least see greater numbers a couple of days on and we weren’t disappointed. There were hundreds – a fair number choosing the car park clearing – the same spot the Small Reds were using last season. Across the Rhinefield Road there were even more, and naturally the heath around Silver Stream completed the spectacle on our short visit. A very bitty but altogether successful outing. Monday began with the irritation of a traffic jam on the M27 as I headed west, and followed with the self-inflicted irritation of attempting to explore some new ground around Sopley Common. 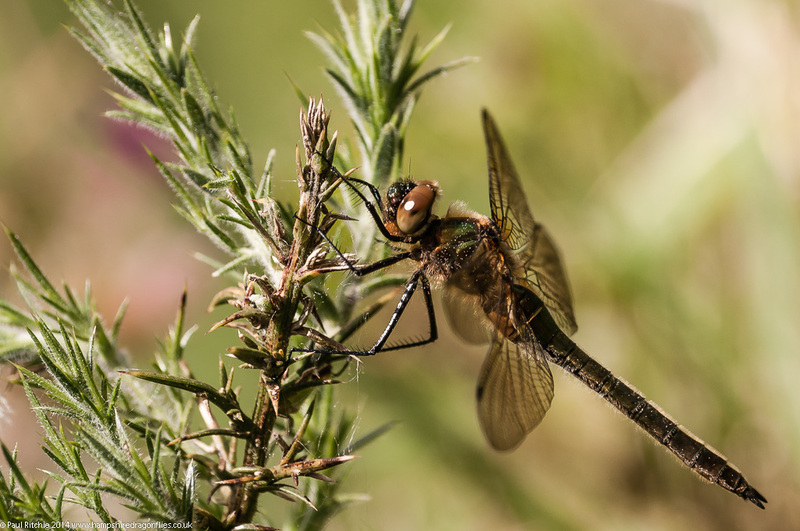 An unnecessary walk saw me arrive at my usual spot across the road at Ramsdown where I finally rousted a few Scarce Chaser, and proceeded to unsuccessfully grab a half-decent shot. 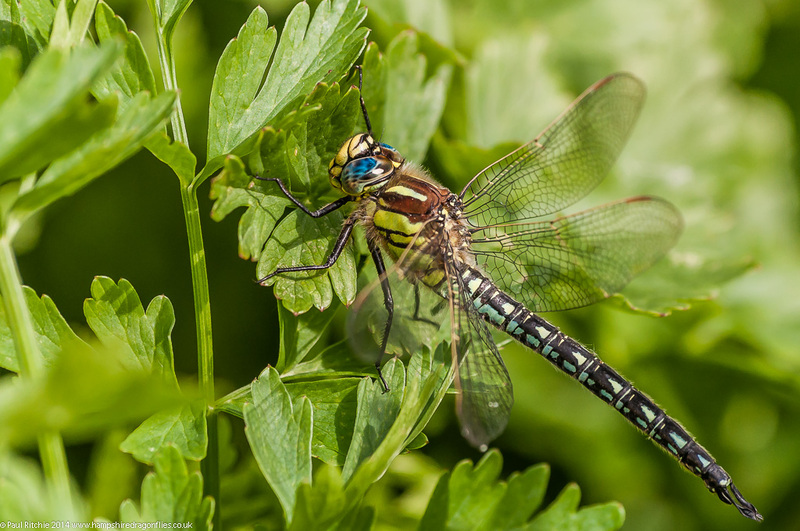 While I was carefully stalking an immature female, my attention was grabbed by something large – maybe an Emperor? No, better! Barely a few metres away was an immature female Golden-ringed hawking for bees, dropping down to consume her courses. After a few minutes she treated me as part of the scenery and carried on with her multi-course lunch, allowing me to get near enough for a photo. I’d all but forgotten about the Scarce, and as I returned to looking I spotted another female Golden-ringed. 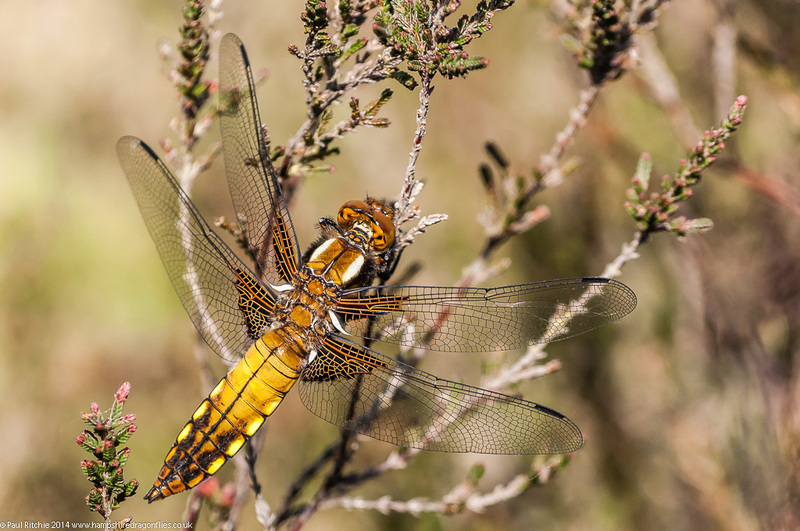 While I was searching the heather for more surprises I came across a Four-spotted Chaser, who offered me precisely the pose I wanted from a Scarce. As the Scarce were proving elusive and difficult at Ramsdown I trudged back to the car and called in at Troublefield, making the most of that meadow before it disappears under the weight and into the gullet of free-roaming beef. 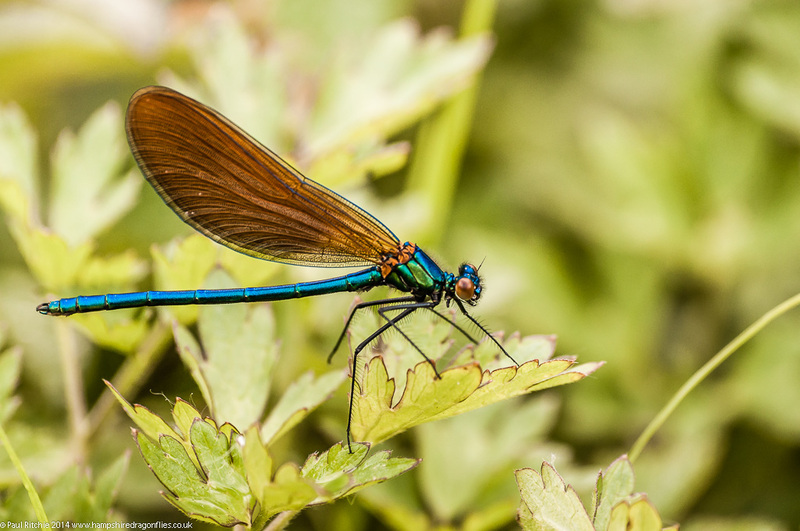 The small clearing on the way in had several Beautiful Demoiselles soaking up the sun on the Rhododendrons, and the path leading to the back meadow showed even more and a very fresh Scarce Chaser – proof that they do indeed breed on the Moors River. In the meadow itself there were a couple more, difficult to follow, and yet another Golden-ringed who rose and disappeared upstream. The butterflies were way down in numbers today. 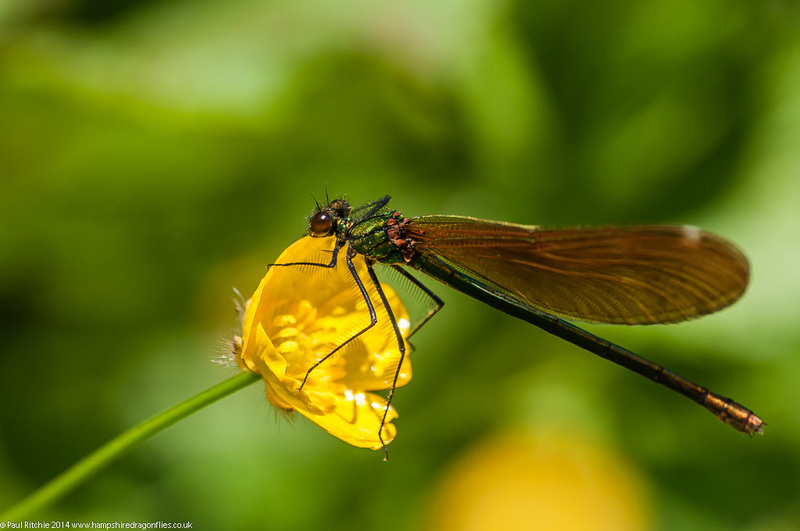 but at least Demoiselles put on the usual fine display. In the corner by the river bend I caught sight of…well, too small for an Emperor. Is that a…Hairy! Totally unexpected and, like the Golden-ringed, another of those moments which really make a day. He carried on hawking around me, not bothered by my presence, and proved to be probably the easiest Hairy I’ve yet had a chance to pin down. Also the first time I’ve seen them at this location. I almost resisted the temptation to scour the other meadows…and should really have listened to my conscience. Another Scarce sighting, but nowhere near the diversity.No, that would do for the day. What more could you possibly want? The change of weather was ideal for a planned day out with a friend of mine, Dave Clay, who was taking a short holiday in Swanage and hoped to bag some of our southern specialities. 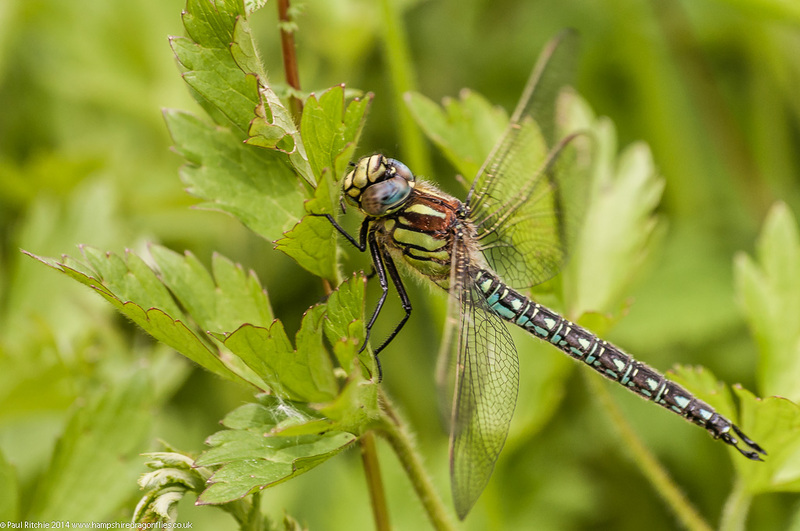 He was keeping his finger’s crossed for some early Adonis Blue butterflies and was rather partial to the Hairy Dragonfly and Downy Emerald – neither of which he’d had the pleasure of seeing before. 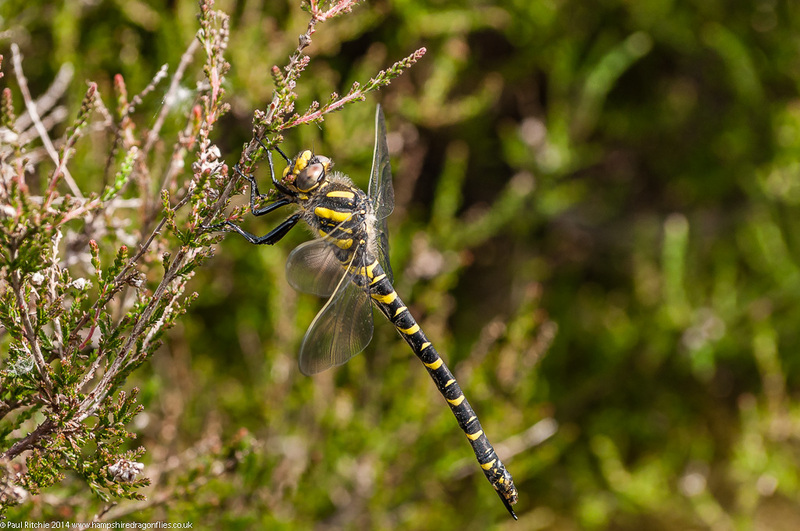 We arranged to meet at Higher Hyde Heath, a small but bountiful reserve near Wareham. Last year proved an excellent season for Downy and plenty of my Dorset Flickr buddies have posted some corking shots already this season. If we were going to find them anywhere, then HHH was a good certainty. We had barely entered the reserve before we were greeted with our first sightings of both Downy and Hairy, patrolling around the upper pond and venturing into the clearing to feed or rest up. The Hairys were particularly uncooperative, and the Downy typically proved hard to pin down. Around the back of the reserve is a reclaimed industrial hard-standing bordered by trees where I spied another half-a-dozen Downy along the bank. As usual they flew up on approach, but circled and more or less returned to the same spot, often choosing a higher perch than previous. Have I mentioned ‘Dorset Gorse?’ Tougher, spikier and deadlier than its New Forest cousin, and able to find its way into your hair and down your back without any problems if you foolishly attempt to mess with it. But messing with it was worthwhile to grab a better angle on a high-perching female. This involved scaling the bank to gain height and literally wearing the gorse bush. Turned out to be my favourite shot of the day and now I had nailed a decent one I could relax and let the others come to me. 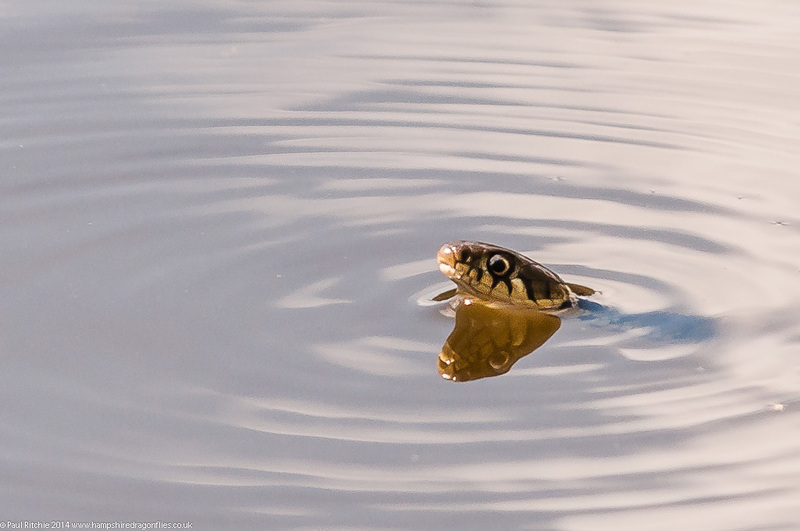 After observing and photographing the Sand Lizards, perched on old red roofing tiles or concrete blocks and used to togger interference, we returned to the pond clearing and waited for some more opportunities, but I struggled to grab a better opportunity. Having had our fill I suggested we call in at Killwood Copse, again a small but productive little reserve tucked away behind the chalk Purbeck Hills. 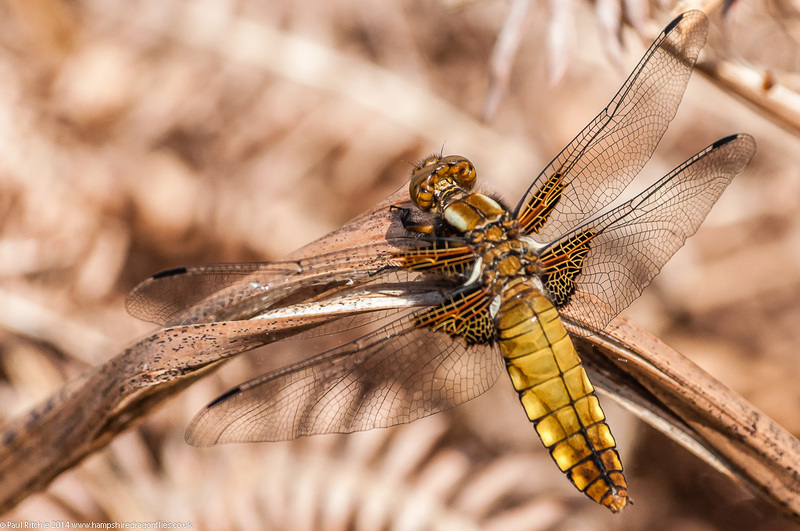 The path inwards usually throw up a few surprises later in the day and season with feeding hawkers, but the small clearing once again provided the bounty with a few male and female Broad-bodied Chasers. Chasing chasers is all very well early season. Fresh individuals always look shiny and new, but I’ve already started hankering after some adults. This male was the closest I came today with the base of the tail already acquiring pruinescence. The sight of another Downy caught my attention – I certainly haven’t become either bored or complacent with this species. Any photo opportunity with a Downy is always welcomed. This female didn’t disappear out of sight and after the initial disturbance, settled contently to allow a few different angles. 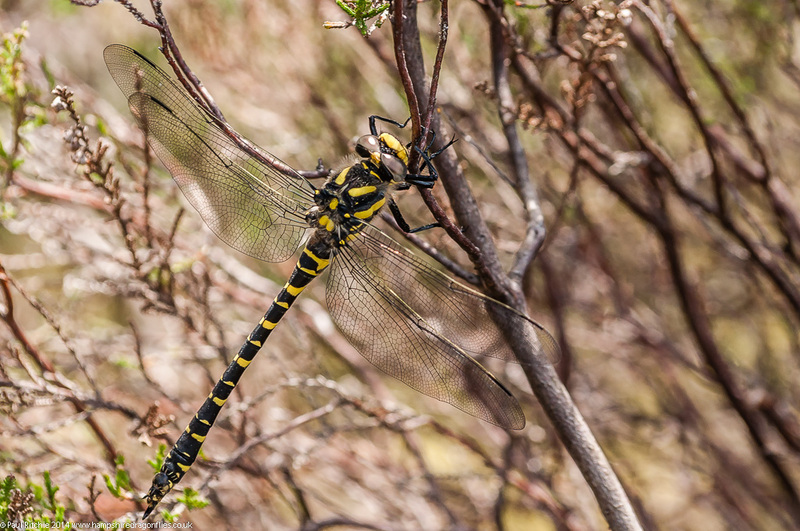 Certainly worthwhile calling in, but that was it for dragonflies as Dave (and I) were eager to find those Adonis. We had been warned that we’re way too early, but having already been sighted in Sussex and the Isle of Wight, I figured we were in with a good chance. And we were. Once again a terrific day in good company with some photos to take home. On Thursday I took another morning visit to Troublefield, calling in at Ramsdown on the way hoping maybe for a Scarce Chaser. Not to be, and to save you the (and me) anguish I didn’t connect with them at all today. In fact I didn’t see anything at Ramsdowm. Possibly a little too early in the day and the lack of any other insects hinted if any were there they’d be buried right down at ground level. To leave the meadow intact until the end of May is all I asked these previous years. Thankfully due in most part to the winter floods and regular rainfall, I’ll get my wish. So if anyone fancies a visit to see what it can be like, get down there before the month is out. I confess to being a little eager and half-an-hour earlier than my last visit, so I had to wait for things to wake up. Sure enough, just after 10.00am the butterflies took to the wing along with reasonable numbers of Beautiful Demoiselles. If I’m honest not nearly as many as last week, but enough to keep me happy and occupied. Besides the Beautiful I had several butterflies to keep me company, with Peacock, Green-veined, Orange -tip, Small Copper, a faded Small Tortoiseshell and even a few Brown Argus providing contrasting colour to the shimmering greens of the reeds and grasses and the sparkling citrus glow of meadow buttercup. 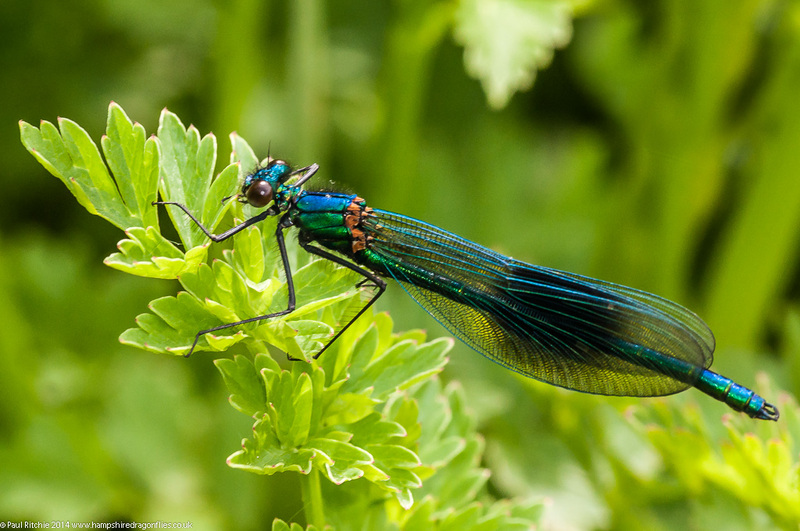 About an hour after the Beautifuls had risen they were joined by a good showing of Banded Demoiselle. Always a great pleasure to witness both in the same habitat, they kick-started another frenzy of chase-me as I attempted to pin one down. In my opinion they are far more scatty than their cousins, but their thumbprint markings on the wing add contrast and interest to any photograph. All in all I spent just over two hours in this meadow, repeatedly going back and forth and generally pottering around looking for an agreeable shot. Anywhere which can hold my interest this long has got to be worthwhile. I even had a couple of moments with some stunning, if formidable-looking Hornets. Just a quick mention that commenting is now turned on should you wish to leave any feedback etc. Any comments are moderated and will need approval before posting as (unfortunately) wordpress is still subject to spam despite supposed blockers. 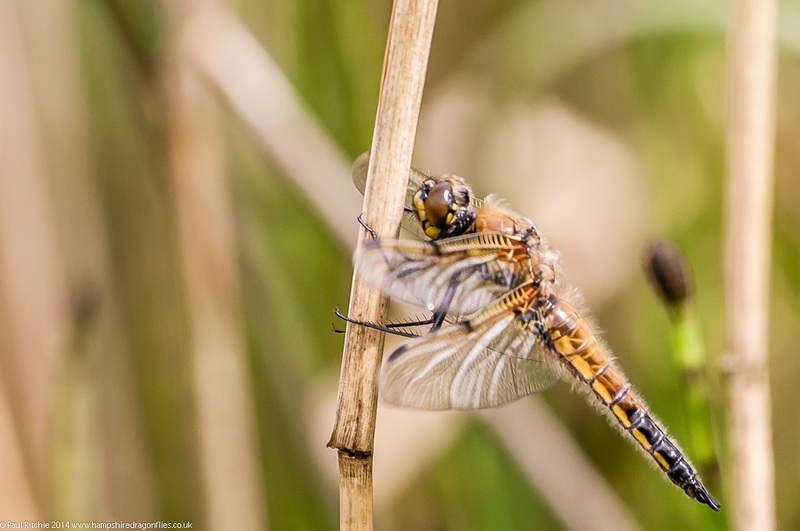 On Sunday afternoon I paid a brief visit to Swanwick Lakes Nature Reserve just to see what was about. The mostly grey and windy conditions meant a little scouting was required to find a sheltered spot or two. I had a few areas in mind, but I would have to take the wind direction into account. 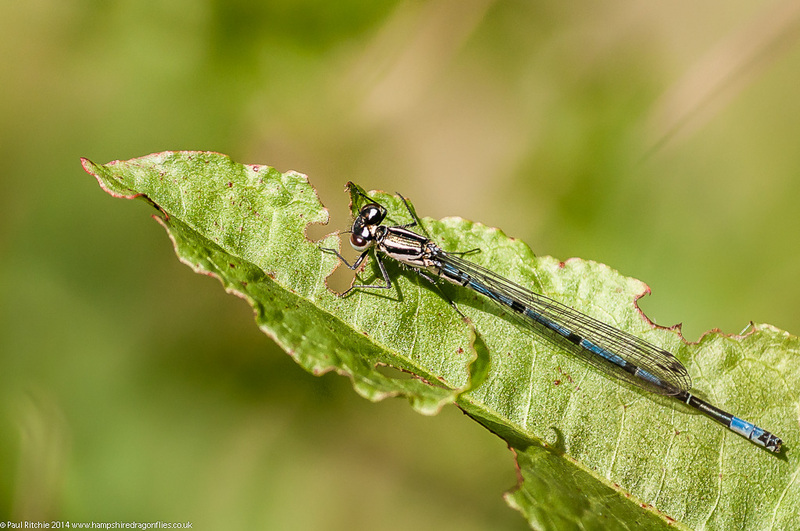 Walking my usual route along the NATS perimeter fence to reach the cut through, I checked the scrub around the gate and found a great many Azure, some Large Red, and a couple of Blue-tailed Damselflies sheltering from the breeze. The scrub on the furthest corner of the rise didn’t produce anything, and a circuit of the fishing lake was almost as unproductive. Even the small clearing only produced a few Blue-tailed and Azure. Next was a stroll along the lane to check the brambles before taking the path through the woods to reach a previously productive sheltered feeding area. Late last season this little stretch of scrub bordering the wood was a hive of activity with possibly my best Common Darter opportunities to date. The tall, dead stalks provided perfect perches for those isolated shots so often favoured by photographers. 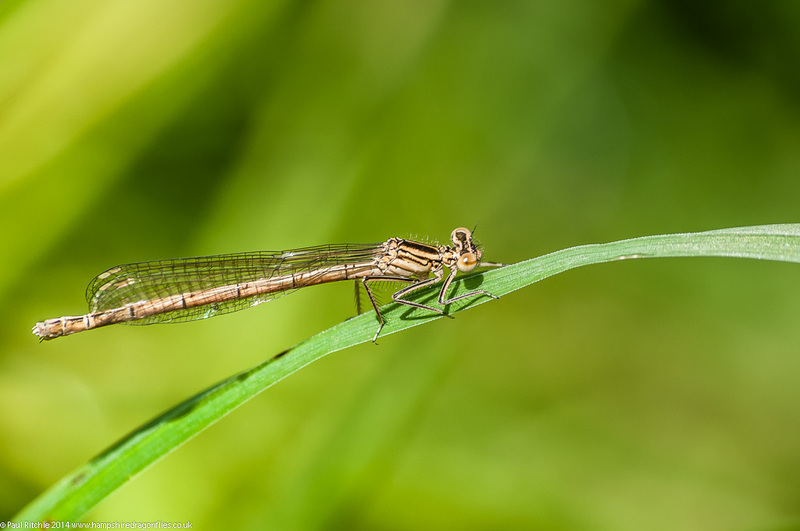 The problem is nature is messy and doesn’t worry about providing nice, clean backgrounds to model her creatures by default, and none of the profusion of damselflies had signed a model release today. While I was doing a fingertip search of the scrub I caught sight of a Downy rising up a few metres ahead, circling the clearing a couple of times before returning more or less to the same position. These opportunities don’t need a model release, and the event had the effect of stopping time, capturing a moment as it happened oblivious to anything else around me. Always nervous, she didn’t stay around for long and found a spot out of sight from pesky humans. Still, that moment of meditation had the effect of glucose on my system and there was an extra spring in my step. Handy for avoiding those brambles. 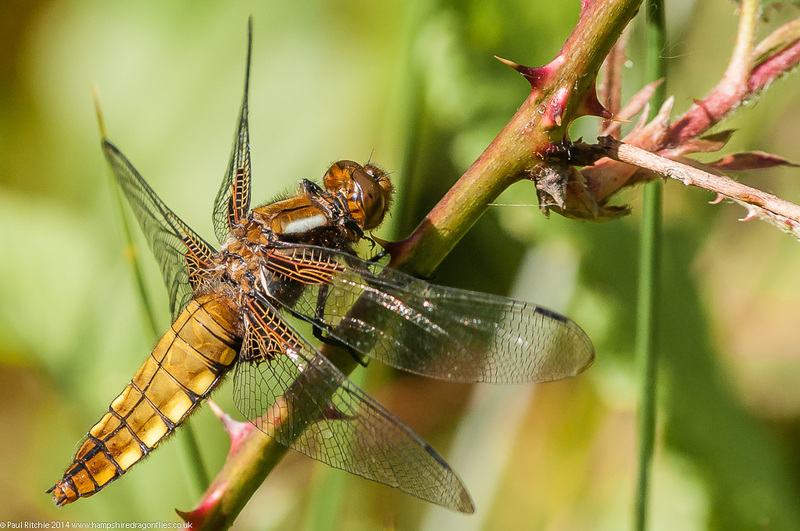 Another root through for any decent damsel opportunities was interrupted by the appearance of a Broad-bodied Chaser. This female was happy to let me watch her forays across the clearing before tentatively alighting a safe distance away before changing her mind until she and I reached a compromise. That would do for a windy Sunday. I couldn’t resist having a look at the gate on the way back though. 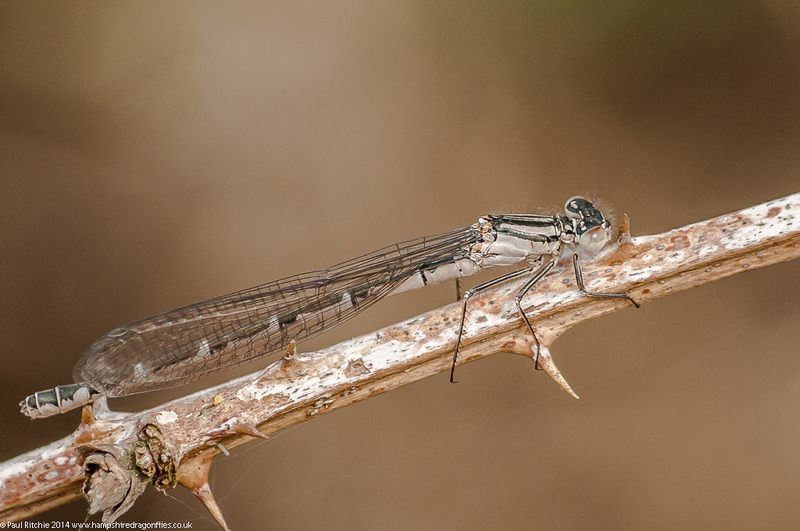 The majority of the damsels were still coy, but an immature Red-eyed allowed me one more for today. Never underestimate the possibilities of a Sunday afternoon stroll; whatever the weather. Friday offered the least wind of the weekend and the sun was in danger of showing itself. These are the type of days I’d normally choose to rest during a ‘heatwave’ – tabloid speak for anything over a day of continuous sunshine. Besides after three days of lousy weather cabin fever had set in. I needed to revisit Troublefield and Ramsdown to check progress, especially Troublefield which I hoped was still cattle-free, although I was ready for disappointment. Thankfully the meadows were still far too wet for grazing, but not too wet for wellies. I tried the northern meadow first, hoping there would be some fabulous undergrowth to explore. I was in luck! There were plenty of nettles and some disagreeable couch-grass, but there were also a good showing of wild flowers. The scent given off by the profusion of wild mint calmed the senses, counteracting the roar of nearby jets taking of from Hurn Airport. This was what I hoped to see. Still too early for the full spectacle, but it’s a start. The butterflies were certainly making the most of it with good showings of Green-veined White, Small White and Orange-tip. There were even a few Peacock strutting their stuff and a single Small Copper – so fresh it immediately jumped to the safety of ground level at my approach. 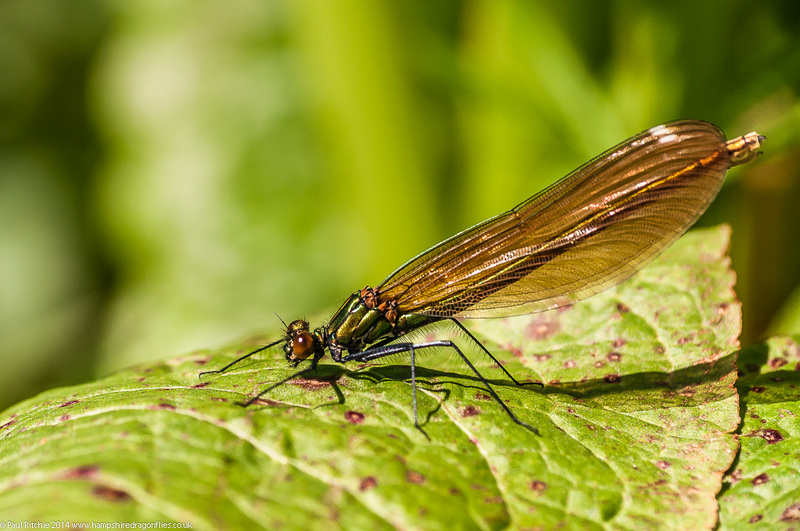 However the real stars of the show were the profusion of Beautiful Demoiselles; some fresh and satin-like on their first flight from the river and both male and female adults shimmering in the humid haze. The changeable conditions made photography challenging, especially for control freaks like me who have their camera set to manual. Just as I’d get perfect exposure on my subject the sun would appear, or indeed vice-versa. The wind didn’t help either, but these days can be almost as enjoyable as wall-to-wall sunshine. Activity was also favourable in the southern meadows, with more Demoiselles, a good showing of Large Red and reasonable numbers of Azure. I had hoped to find something larger, but considering they are just emerging it may take them a while longer to discover these bountiful feeding grounds. I decided to explore a little closer to their watering holes, choosing the heather-clad hillock and small, peaty ponds of Ramsdown. If their were any larger species around they would certainly show themselves here, but that wind…frequent heavy westerlies sneaking through the trees and suddenly I was transported from paddy-field to bleak Brontë country. I did find a few sorry-looking Large Red eager to get down low, which is probably where the rest of them were, and disturbed a Downy – the first (I think) I’ve seen here – who headed high across the trees. 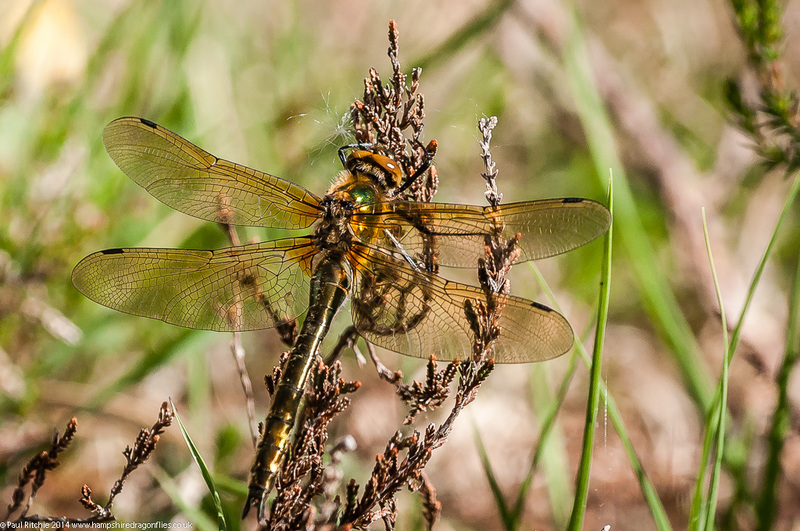 No Four-spotted, no Broad-bodies and unsurprisingly no Scarce Chasers anywhere in sight today. Instead I spent some time fighting the breeze and the gymnastics of a Black-headed Cardinal Beetle. A little exhausted with uneven terrain and paddling, I decided against Blashford and instead chose to have a look in on Cadnam Common. No sooner had I reached the pond than a mature male Broad-bodied flew across in front of me – the first familiar splash of powder-blue this season. The wind was pretty strong here, so the pond didn’t have any action. A few weeks from now and these gusts would act as a form of hyperspace for the chasers, but for now they were keeping low in dead fern or high in gorse, feeding up in readiness for the big party. Broad-bodied outnumbered the Large Red I could see, and at last a couple of Four-spotted Chasers making an appearance. We all like warm, sunny days to indulge in our passion, but there’s a lot of enjoyment to be had when conditions aren’t ‘perfect’. In this country we rarely have a choice. On Sunday I took a trip out to Bentley Woods for the Pearl-bordered Fritillary; I didn’t even bother with the ponds. On the way back I called into Cadnam Common to check on progress and it still feels rather sleepy. 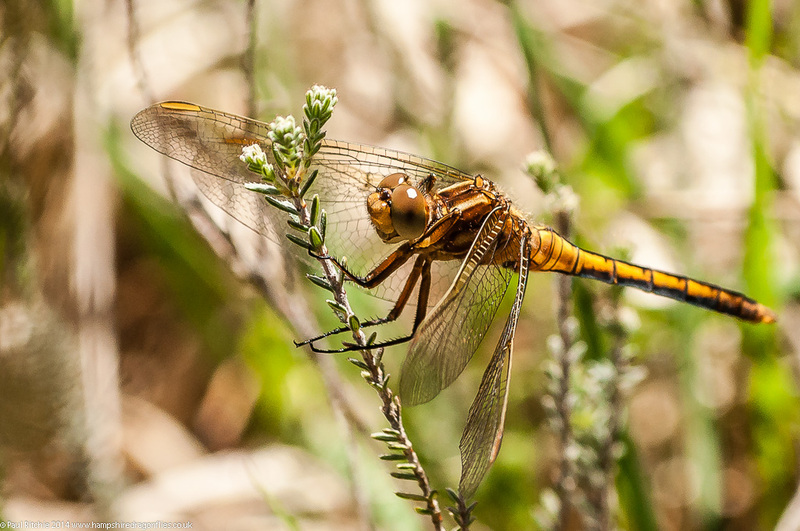 Surprised I didn’t see any Large Red, but at least I was rewarded with half-a-dozen fresh Broad-bodied Chasers. 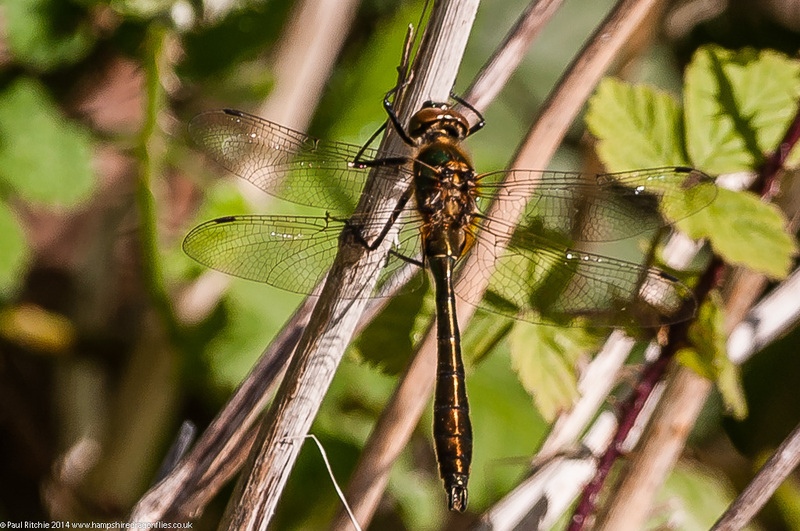 Still no Four-spotted Chasers yet, so on Bank Holiday Monday I revisited Titchfield Haven – usually a good early site for them. An early start – arriving at 10.00am to make the most of the remaining sun. There was a brisk SE wind spoiling most of the preferred sheltering areas of the pond. Large Red were by far the most numerous, closely followed by Azure. Surprisingly still low numbers of Blue-tailed compared with my first visit this year. 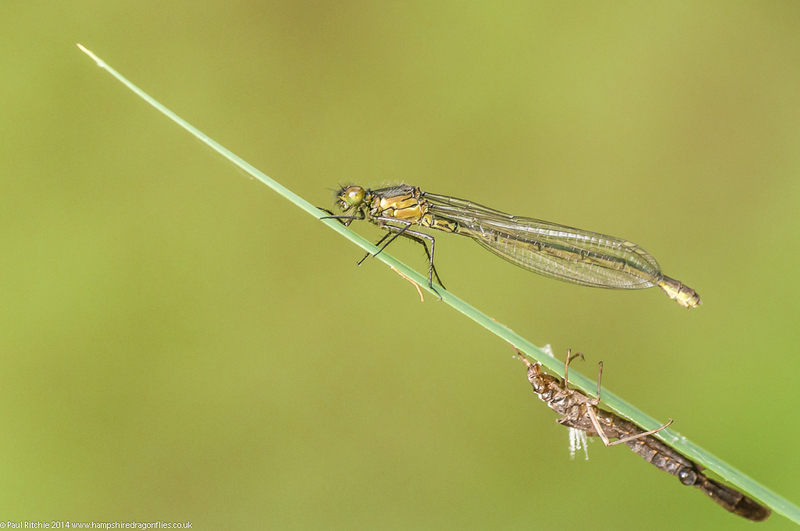 Almost as soon as I arrived there was a male Hairy weaving in and out of the pond reeds, my other hope for today. This is the first time this season I have seen activity over the pond, with a few Large Red joining him during the sunnier moments. 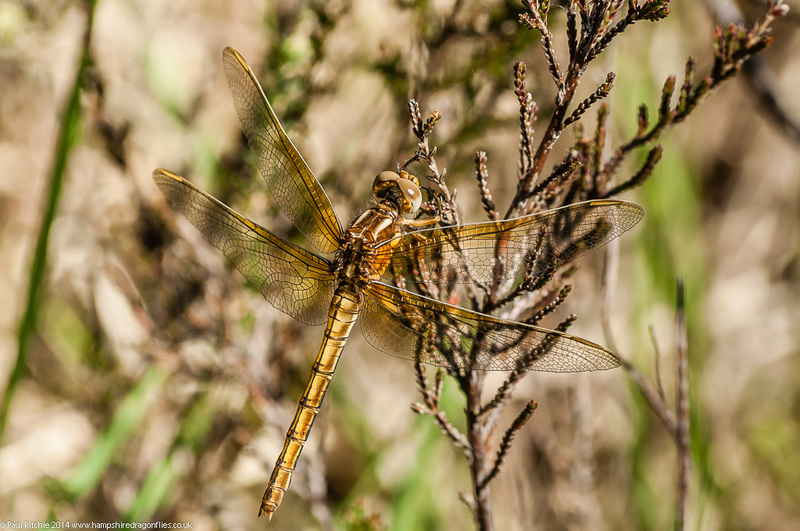 After frequently losing sight of my quarry I explored the undergrowth searching for something interesting, and over at the other pond I disturbed a fresh Four-spotted Chaser, losing it as it floated across the channel. Now I knew they were there. It was while I was using my fingers to gently part the foliage that I spotted my prize of the day, not quite believing what I was seeing. Calmly perched behind some leaves (I need to find the name of the plant) was a male Hairy – quite possibly the one entertaining me earlier. Satisfied with getting my prize I took another wander, hoping to find another Four-apotted. 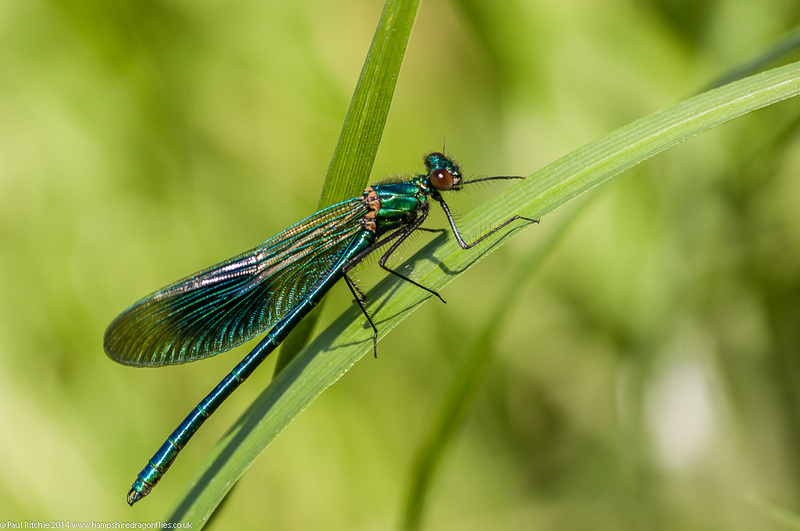 Once again fine-combing the undergrowth I spotted my first Banded Demoiselle of the season; a tad surprised I hadn’t seen one sooner. A Beautiful Blue male who gave me the run-around before I could get a shot I was satisfied with. 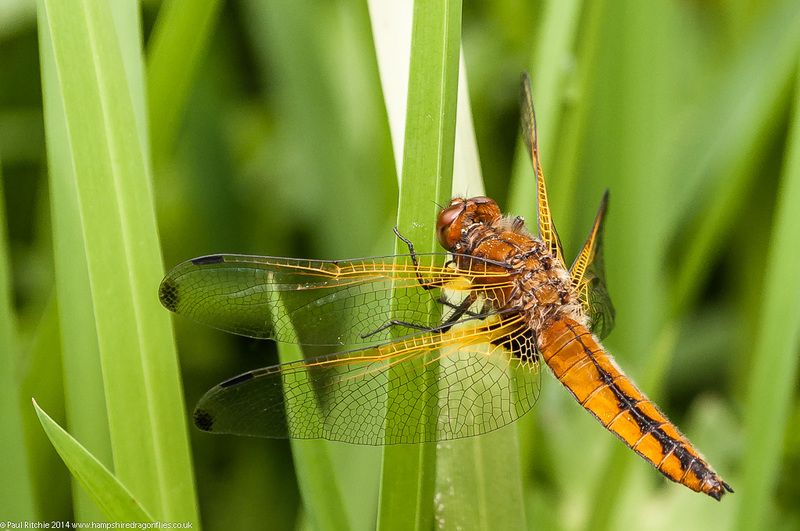 While I was going in for another try a Four-spotted Chaser flew over my head and landed on one of the reeds in the pond. An incredibly annoying position, made even more difficult by me plunging thigh-deep into the water. Not the best shot but the only chance I had. As I squelched back to the seat I briefly wondered if it was worth it considering there’ll be swarms of them and far easier to photograph in a few weeks. But that’s not the way it goes early season. This is after all what I love to do. So another excellent result with 2 new species added to the list for this season, making 11 to date. 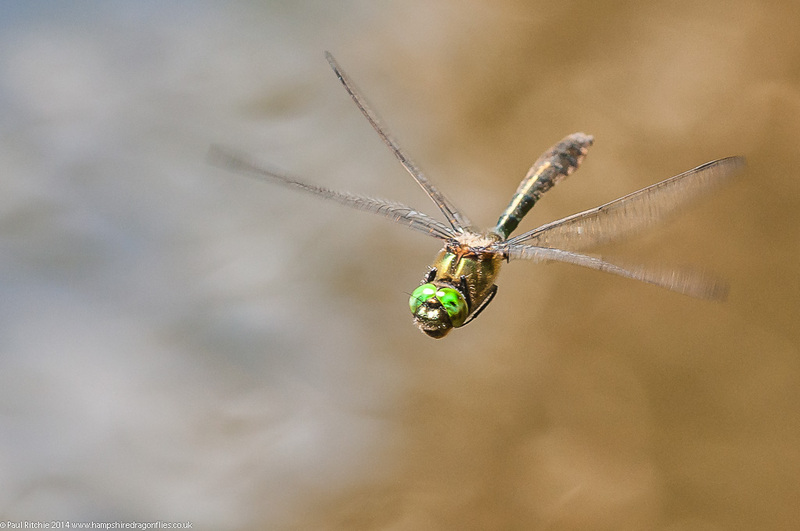 I enjoy the freedom of solitary dragonfly excursions, especially when it comes to photography. My mind (and lens) is more focused and there’s no doubt I acquire some of my best images without the distractions or responsibility for anyone other than myself. If I miss a shot or fall in a water body I only have myself to blame. I also fully enjoy the companionship of like-minded souls who share the passions; whether it be with a regular friend or acquaintance, or a small group all after the same goal. Four eyes are better than two (or one in my case!) and more are even better, allowing opportunities which would otherwise be missed. Like most things in life a passion shared is infinitely more enjoyable. We learn far more through interaction, especially in the field. 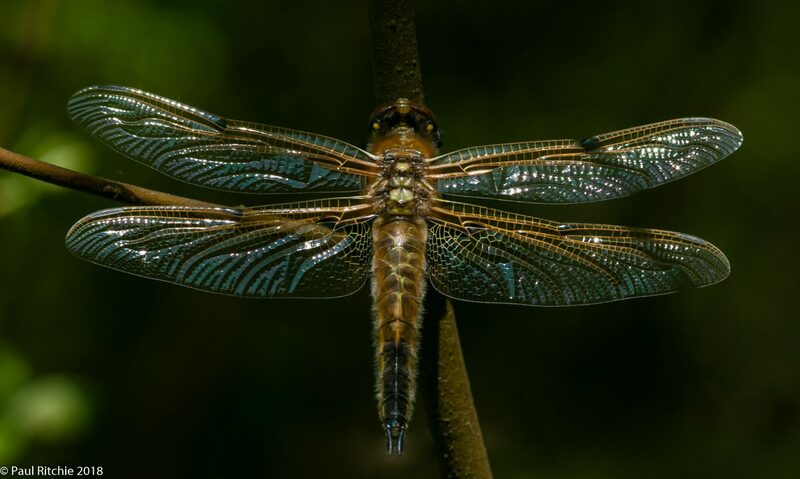 I’ve certainly learned more about dragonflies and photography by being hands on from those who can actually teach you something practically rather than academically. On a few occasions during the season I like to share my local knowledge and lead trips for visitors to the area. and again I get immense pleasure from helping provide the opportunity to bag a New Forest special or visit a prime area in what can be a daunting environment for the unfamiliar. There is no substitute for local knowledge and I’m grateful for every opportunity I’ve had in the presence of someone who knows the territory. When I lead my photography usually takes a back seat, unless of course something special appears – and when it does I panic, hoping I can break out of the snapshot mentality and concentrate on grabbing the moment satisfactorily. 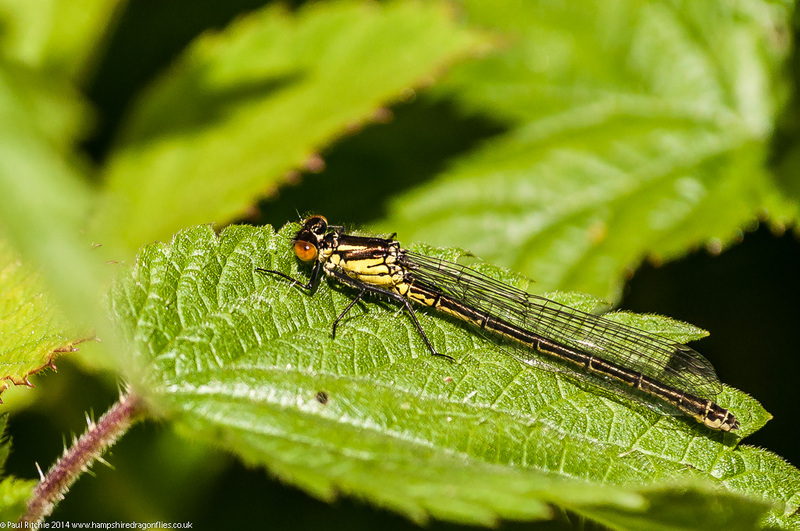 On Saturday I met up with John Curd, a friend from UK Dragonflies who I first met at Goring 3 years ago. 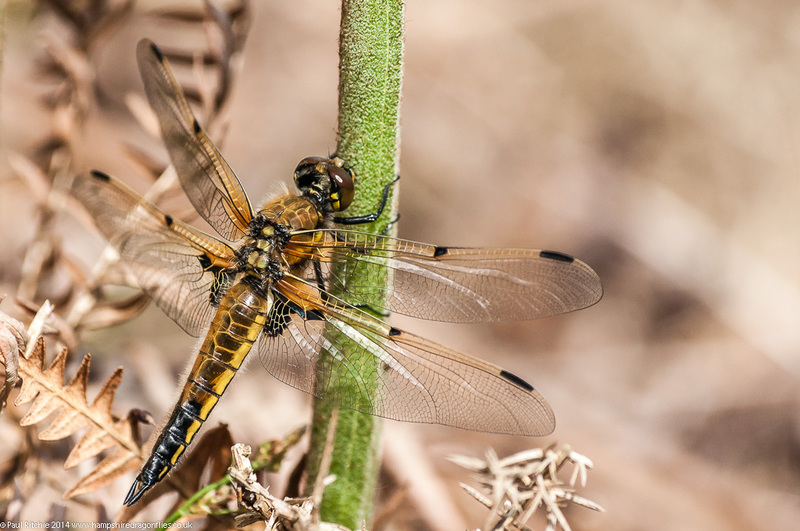 John and his wife, boss and companion Carol had booked a fortnight in Hampshire Everglades/The New Forest and hoped to meet up for a drink and maybe a successful dragonfly foray. Already acclimatised after a week of typical Spring weather, closed car parks, unfriendly terrain and so far only Large Red to show for his trip, we arranged to meet on a sunny, if chilly, Saturday. When John first mentioned the dates I worried he may go home somewhat disappointed as it doesn’t normally begin to kick off until mid-May. Luckily the unusual Spring we’ve experienced has allowed for some early emergences and thankfully the scout I’d done during the week meant we should at least observe 4 or 5 species. 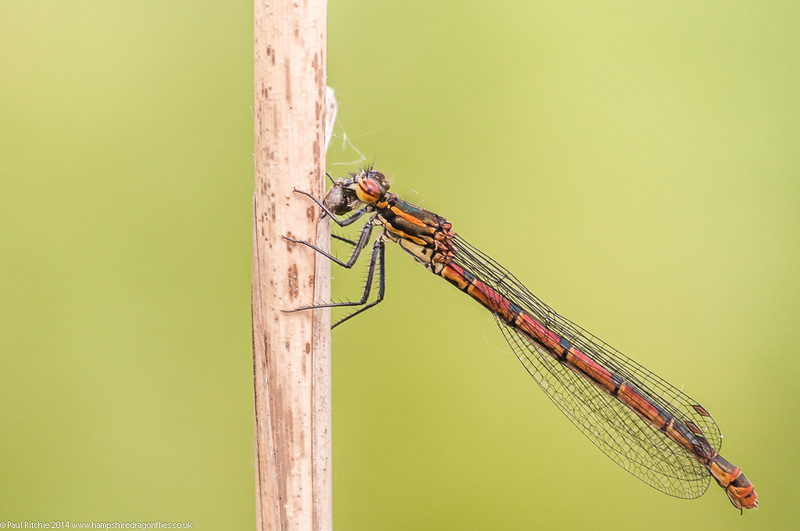 We met in Lymington for a tour around the Keyhaven area where we clocked up Large Red, Azure and Beautiful Demoiselle in the first five minutes, shortly followed by Blue-tailed and Red-eyed – the full cast from Wednesday only in greater numbers. Especially surprising were the amount of female Red-eyes. I normally come across one or two off-water during the early season, but obviously timing is a factor. A good two hours in the undergrowth provided more than enough photo opportunities for John and Carol while I searched the undergrowth and shoreline for something different. However it was John who spotted the Hairy, which flew up and over the stream before he had a chance to grab a shot. Species number 6 though! 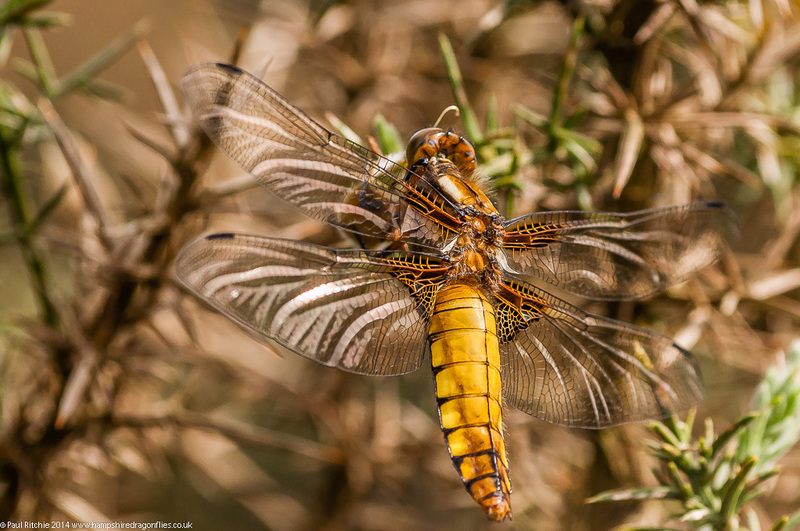 We broke off for tea before initially deciding on Crockford in the hope of finding a Broad-bodied Chaser or two. While we took our break I had a text from Doug who wanted a report and we agreed to meet up at Hatchet Moor, a location I’d intended to finish the day with. 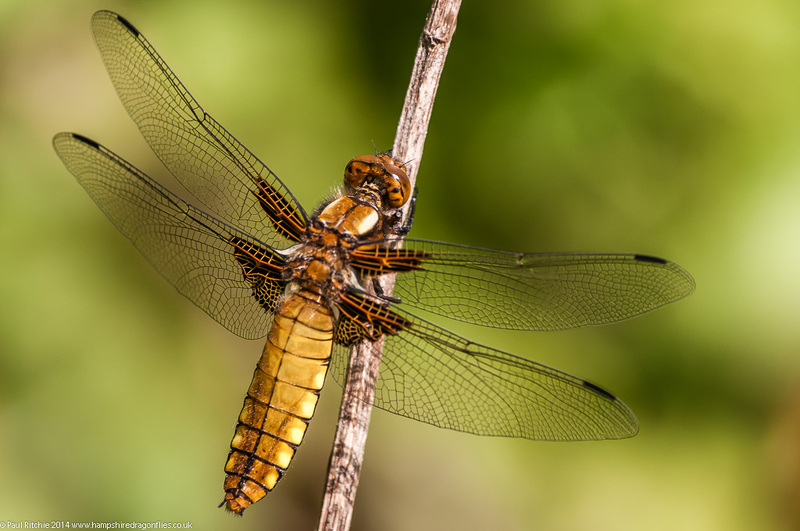 As it was we didn’t have to muddy our boots at Crockford, as the sight of our first Broad-bodied Chaser, closely followed by another offered species number 7. Greater quantities of Common Blue upped the count to 8. Doug joined us just after we spotted another BBC, and Sue & Carol had spotted a couple of Downy Emeralds. Species number 9, but we had no photo opportunity. We did a circuit of both ponds and shortly before we returned to the car park Doug spotted a Downy which flew up and threatened to perch in the trees, but luckily circled and came down to land on the ground before us. Just enough time to rattle off a couple of shots before rising again and disappearing for good. All in all a cracking day in good company with quite frankly a cracking result for the beginning of May. It was inevitable we should have a period of miserable weather after a striking early Spring. Anxiously waiting for a shift, I tentatively continued to check a few local sources – including some not visited for years. After the delights of Durley in my last posting I jumped the gun a little at Itchen Valley Country Park. Nothing to show except a couple of Large Red. Not a Banded to be seen anywhere, but the meadows remain exceedingly wet. The ‘local’ pond threw up a few more Large Red, but nothing different (yet), and a scout around Hamble Common revealed a good possibility for action later in the season. Since I last visited there appears to be greater access to a brackish pond fed by one of the numerous inlets. 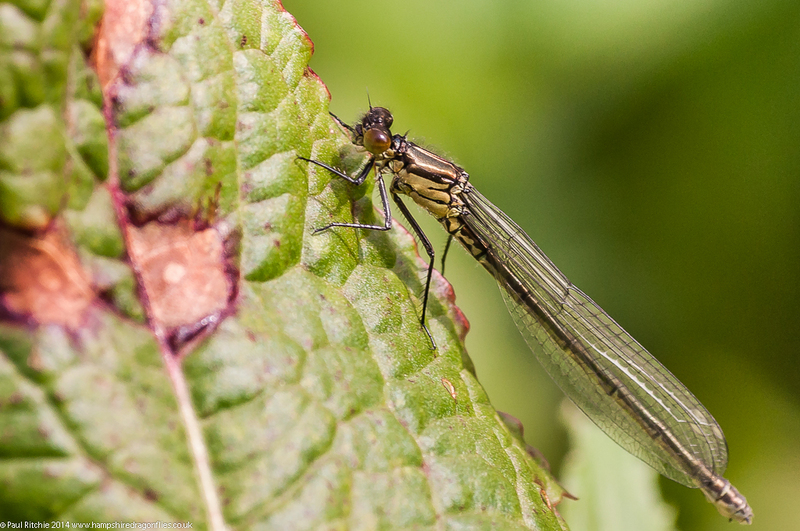 On a more positive note a visit to a very foggy Swanwick Lakes yesterday morning in hope of a Downy did at least provide one emerging female Red-eyed Damselfly. Buoyed up by this encounter I was looking forward to a New Forest transect in the afternoon, taking in Pennington, Crockford and Hatchet Pond. 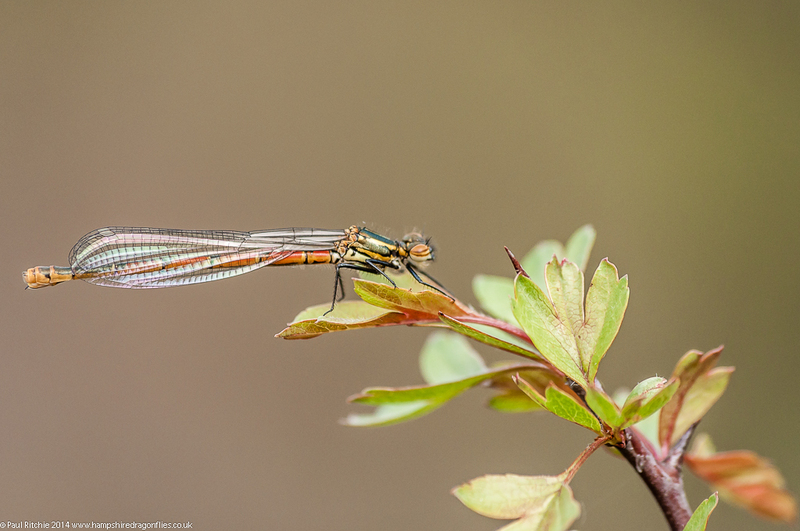 Pennington proved to be the most prolific with plenty of Beautiful Demoiselles, the expected gathering of Large Red, a scattering of Azure, only a few (surprisingly) Blue-tailed and the second female Red-eyed encountered this day. I did hope for a Hairy or two. 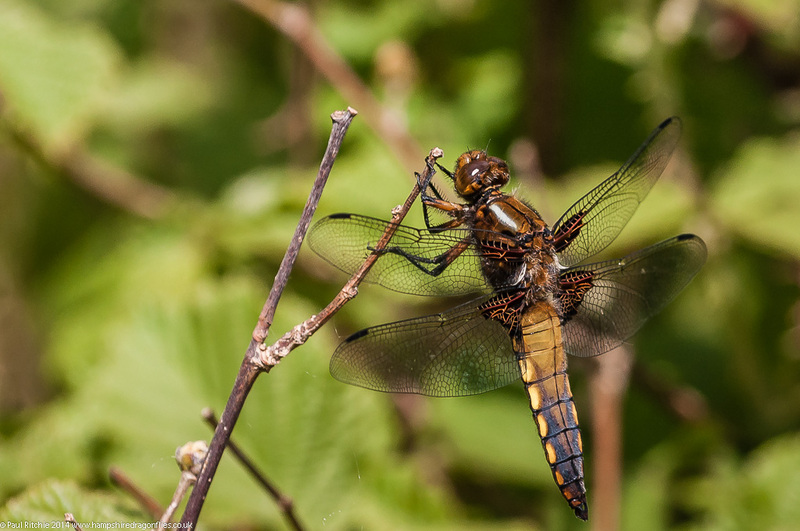 Not to be, but at least a very wet Crockford provided by first Broad-bodied Chaser of the season. Just the one, and she gave me the run-around! The only other odos at Crockford today were a few Large Red. 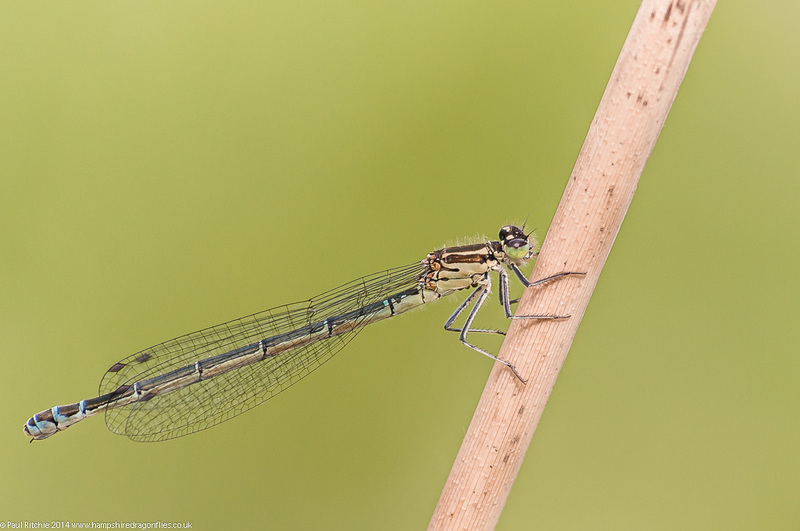 A transect of Hatchet Small Pond didn’t reveal any hoped-for Downy, but did at least provide me with a Common Blue. So 3 new species today bringing my total to 8, which is rather outstanding for April. Here’s to a prolific May! Note:- It is still exceedingly wet in the New Forest, so I advise anyone planning a visit to some key sites to wait a while until the waters recede.